I had to work last night. During my breaks I went outside…and it was a MONSOON, seriously…the winds were definitely insane…the rain pelted my little body. Go back out to the ocean, and turn back into the state…projected right on top of me…and possibly stronger. So I am on my vacation now..and so far, isn’t the best. Hope if you are near my area that all is well with you! 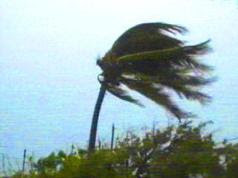 ← God’s grace in Ephesus: Eph 2:1-10 " filling the void"
who’s insane enough to go windsurfing in a tropical storm?? ?